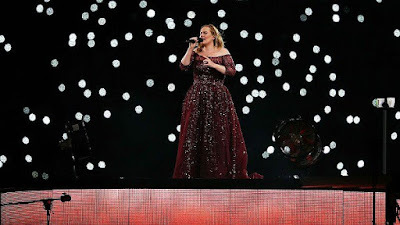 Multiple Grammy Award winner, Adele had no choice but to stop a concert in Sydney after a female fan had a heart attack during live performance and emergency services were called. A 47-year-old woman had collapsed from a cardiac arrest during Adele’s concert in the ANZ stadium and taken to the hospital during her performance on Friday, March 10, 2017. The over 95,000 fans who had made their way to the ANZ stadium last night to see the British singer perform had to clear a path to allow paramedics to get to the ill woman. Adele, while stopping her performance midway, told her teeming fans that she didn’t want to shock the sick woman with fireworks that were planned. She also joked that she had ruined the surprise for the rest of the audience by telling them about the pyrotechnics. She continued the show after a brief pause. Initially, it was thought the woman had suffered some kind of spinal injury, because paramedics had brought a stretcher into the arena with them. This is even as an eyewitness also added that nobody had paid the situation any attention until Adele stopped the show shortly before launching into Rolling In The Deep.